The first option is a several days long trekking from the north (from Illaga) via the New Zealand Pass, or from a different airport near the Carstensz Pyramid. The second alternative is a flight with a helicopter directly to the camp in Zebra Whal (3800 m, 12467 ft). The trip via Freeport of Indonesia is not possible anymore, because the management of the company refused to issue permits to climbers for passing the mine. There are several travel agencies in the world, which organize the climbing of the Carstensz pyramid with the support of helicopters. From time to time, one of the individuals tries to organize a trekking expedition. 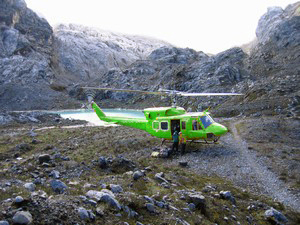 Our agency organizes Helicopter trips, as well as trekking. We also offer the European guarantees. Check our website at www.AbsolutAdventure.com. See the program & schedule for Carstensz expeditions, in case you want to reserve your trip, see our contact page.